There's no point in owning or starting a business unless you believe in your idea wholeheartedly. Trouble is, it's easy to persuade yourself that the concept on which you're basing your entire venture is better than it really is. One of the best things about applying for a business loan -- perhaps one backed by the federal Small Business Administration -- from a professional lender is that a pair of clinically cold eyes is going to be cast over your business plan. Many of the assumptions it contains are likely to be challenged, and a dose of realism can rescue you from overconfidence. Chances are, you're going to be personally liable for your business credit card debt. That's pretty much inevitable if you're a sole proprietor. But, even if you have a limited liability company or corporation, many card issuers are going to insist you sign a personal guarantee. That means you and your personal credit report are on the line. 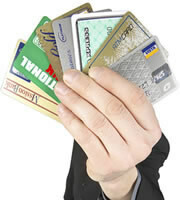 Business credit cards are not covered by consumer regulations, including the Credit CARD Act of 2009. So your card issuer can hike your credit card rates, implement penalty rates, change your billing cycle, and charge what it likes in fees -- pretty much at will. None of this stops many small businesspeople from using their cards as a source of working capital. Last June, Pepperdine University's Graziadio School of Business and Management published the results of a survey it conducted among 6,000 small business owners. Of those needing financing in the six months following the poll, a surprisingly high 40 percent of respondents claimed they would use a business credit card as a funding source. That's more than the 36 percent who planned to check out a credit union or Community Development Financial Institutions Fund (CDFI). It was, however, fewer than the 68 percent who'd be seeking a bank loan. It's interesting to compare that June survey's results with those derived from a similar Pepperdine study back in December 2011. In the earlier poll, very nearly half (49 percent) of respondents, said their businesses had turned to credit cards for funding in the previous 12 months. That may have been, at least in part, because only 41 percent of businesses that had sought capital during that period had found the money they were seeking. Of course, there are many good things about applying for small business credit cards: you stand a good chance of being approved, providing your credit score is respectable. And you're likely to access the line of credit you need much more quickly than through other lenders. At least as importantly, many of the products designed for businesses are rewards credit cards, offering genuine and significant benefits for all sorts of purchases, and especially air travel. Some have perks, such as free access to airport lounges and line-busting priority check-in, security screening and boarding. And many offer serious sign-up bonuses worth hundreds of dollars, or tens of thousands of miles or points. If you take advantage of these, and pay off your balance in full every month, then you could easily find that your business plastic is an asset to your company, rather than a liability. In recent years, there's been a lot of preaching about the morality of debt: A government, a company, a person can't borrow their way out of trouble. But that's clearly nonsense, at least in some circumstances. Shutter your business, and fire your staff, meaning you and they must claim welfare until new jobs are found. Call your supplier, get your freezer fixed, pay by credit card, and open for business as usual the following day. Surely, your decision is a no-brainer, always providing your freezer repair and existing debts aren't going to affect the overall viability of your enterprise. Credit cards offering zero percent balance transfer deals could mean you could probably pay back the cost of fixing the freezer over the vacation season -- without paying a cent in interest. When it comes to debt, business credit cards are just like consumer ones: they're likely to benefit you more if you clear your balance every month. And, compared with bank and similar forms of borrowing, they're expensive. Moreover, they're liable to bite you -- hard and painfully -- if you don't treat them with respect. But, if you, in common with 40 percent of other businesspeople, find you need to use yours to keep your viable venture afloat, then you have no reason to feel embarrassed. 0 Responses to "Business credit cards may boost your company"